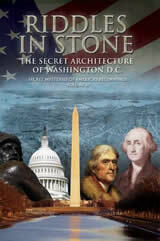 Part two explores the highly controversial subject of America's capitol. Was the city built to reflect the majesty of American freedom, or the hidden agenda of secret societies? With every major cornerstone laid by Freemasons, was the city built in a Masonic pattern? Embark upon this incredible journey as Riddles interviews experts on both sides of a heated debate. Watch as Freemason apologists defend some of the most direct and hard-hitting questions concerning the influence of Masonry in America, and its symbolism in Washington D.C. Alongside them are leading researchers who maintain that occult architecture permeates the city, and conceals a secret agenda. Was D.C. laid out according to the pattern of the stars? Is there really a pentagram in the street layout north of the White House? Does a Masonic square and compass extend from the Capitol building to the Washington Monument? And why is the city filled with zodiac symbols, mysterious faces, and various god and goddess images? If America was founded as a Christian nation only, where are the images of Jesus Christ? Or does Washington, D.C. symbolize another Christ, the Masonic Christ? Find out, in this bold and sure-to-be controversial documentary. Riddles in Stone $29.95 plus $6.00 for S/H. For each additional DVD add $1.50 for S/H. Running time: 170 min.